A few hours after her fateful fall on the ski slopes, Natasha Richardson appeared "disoriented … with signs of confusion, a concussion," according to a medic who radioed hospital staff from the ambulance. In tapes of the 911 call obtained by Canada's Globe and Mail, the actress's condition initially appeared mild. "10-17," the medic says at 1 p.m. on March 16, meaning he has arrived after a call to the 911 dispatch center near Mirabel, Quebec, in response to Richardson's fall at the Mont Tremblant ski resort. "Uhh, we're still waiting for the patient." Richardson, who was then feeling lucid, had declined treatment. "There's a [ski] patroller who just went by, who tells me it's a 10-3," the medic reports to dispatch at 1:11 p.m. In ambulance code, 10-3 indicates the job is cancelled. But as mid-afternoon approached, Richardson began to experience severe headaches and the dispatch received another emergency call from the hotel, this time with the code "17-Delta-1," which indicates the situation is now classified as "dangerous." Within 45 minutes, the medics had rushed Richardson into the ambulance and were headed to the Centre Hospitalier Laurentien in Sainte-Agathe, a local hospital. 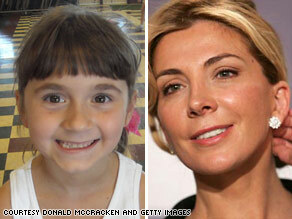 Connie and Donald McCracken were watching CNN one evening last week when they learned of the tragic death of actress Natasha Richardson from a head injury. Immediately, their minds turned to their 7-year-old daughter, Morgan, who was upstairs getting ready for bed. Two days earlier, Morgan, her father, and brother had been playing baseball in the yard of their Mentor, Ohio, home when her father hit a line drive that landed just above Morgan's left temple. A lump formed, but the McCrackens iced it down and the swelling subsided within an hour. "For the next two days, she was perfectly fine," Donald McCracken says. "She had no symptoms. She went to school both days and got an A on her spelling test as usual. There were no issues whatsoever." But after hearing about Richardson's death, the McCrackens wondered if Morgan was really as OK as she seemed. After all, Richardson had been talking and lucid immediately after her fatal injury. When they went upstairs to kiss Morgan good night, she complained of a headache. "Because of Natasha, we called the pediatrician immediately. And by the time I got off the phone with him, Morgan was sobbing, her head hurt so much," McCracken says. Tonight, Mitt Romney! His party's in turmoil and its leaders in question! How would he handle the AIG debacle? And, can he help bring the Republicans back to power? Mitt weighs-in on Rush Limbaugh, Pres. Obama and more! Plus, Natasha Richardson's death ruled an accident. How you can prevent a similar tragedy. Experts explain what to look for should you or someone you love suffer a head injury. Tonight, New York City's Medical Examiner's Office ruled actress and mother of two Natasha Richardson's accidental death was caused by blunt impact to her head. So, what happened in the moments following her fall on a Canadian ski slope and why were paramedics, who, reportedly, arrived within minutes turned away? Reporters and medical experts with the latest join Larry to talk about today's developments. Then, how can you prevent a similar tragedy? Would a helmet have helped? What should you watch for if you or someone you love falls? Our experts help you with the answers tonight! WE WANT TO HEAR FROM YOU! CLICK HERE to leave a comment or question. Then, tune-in tonight. We may use it on the air! Meanwhile, tributes pour-in from Hollywood's elite. "... She is irreplaceable in our lives; She gave us so much, so generously," said Meryl Streep. "She was a wonderful woman and actress and treated me like I was her own," said Lindsay Lohan. Regis Philbin said, "She was a lady. I can't tell you enough what a good person she was ..."
Also on the program tonight: Mitt Romney! His party's in turmoil...its leaders in question. How would Mitt Romney handle the AIG mess and bring the Republican Party back from the brink? He'll join Larry on set in L.A., to talk these and other topics. It's all tonight on "Larry King Live," at 9 p.m., ET.